The handed digital tachometer DT2236 is a contact and a reflecting multifunction revolutions counter. The instrument is built into a self-exstinguishing, anticollision plastic case. The steel exit shaft revolves on high speed bearings. The instrument and its fittings are keeped in a special bag. ● apply a 10/12 mm long strip of tape on the revolving part and direct the pencil on it (distance 50/150 mm., 300 mm. maximum). In the case of low speeds put on some more strips. In this case the value displayed should be divided by the number of strips. ● use special coupling drivers. 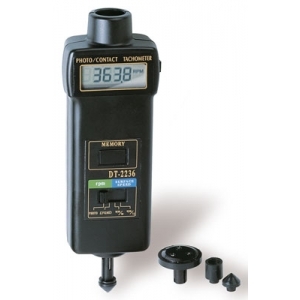 Contact tachometer measure field 0,5-19.999 rev./minute - 0,05-1999,9 m/min.- 0.2 - 6560 ft/min.